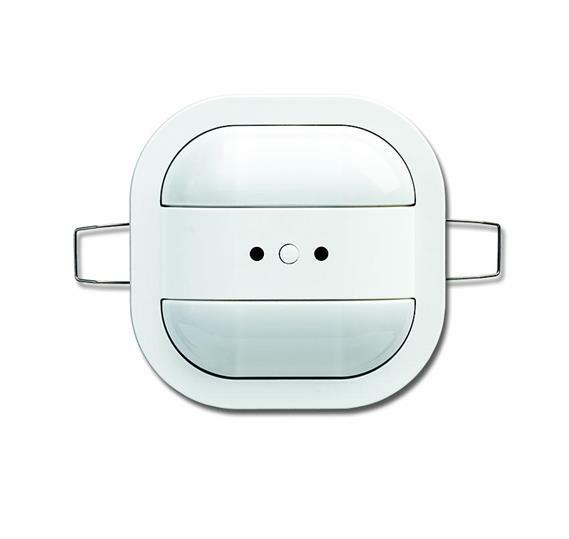 Detection range (for mounting height 2.5 m, 3 m and 4 m): circular. Seated persons : max. 5 m, max. 6.5 m and max. 9 m. Walking persons : max. 6.5 m, max. 8 m and max. 10.5 m. Visible height 16 mm. With 2 channels. 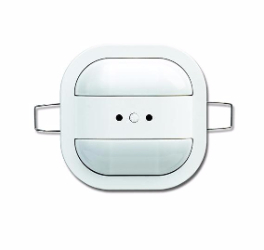 Targeted for connection and disconnection of lights bands depending on the room brightness. Regulation in response to the movement possible. Using the device as presence and/or movement detectors. Detectors application with 2 power off stages. Detectors application with integrated monitoring function. Constant light switch with up to two independent channels. Constant light switch with max. 2 outputs for brightness-dependent switching of two light bands in the area. With integrated KNX bus coupler. Suitable for false ceilings with a board thickness from 9 to 25 mm. Hole size: 68 mm. Suitable for surface mounting installation. Cannot be installed in British Standard or VDE flushmounted box. Recommendation: Installation housing from Kaiser HaloX-O (Art.no. 1290-40) with corresponding cover plates (1290-47 or 1290-85 for fair faced concrete) or IBTronic H120-68 from Spelsberg.